A duffel coat, or duffle coat (standard UK spelling), is a coat made from duffel, a coarse, thick, woollen material. The name derives from Duffel, a town in the province of Antwerp in Belgium where the material originated. Duffel bags were originally made from the same material. The duffel coat may have initially come from the Polish military frock coat, which was developed in the 1820s. The hood and toggle fastenings proved popular and it spread across Europe by the 1850s. By 1890 it was being supplied to the British Royal Navy, and Field Marshal Montgomery was a famous wearer of the coat in World War II. After the war, the coats became available as government surplus stock and became popular, especially with students. The coat is made of dense woollen cloth, and distinctive features include a capacious hood that can be worn over a uniform cap, three or four wood or horn toggles with leather loops for ease of fastening when wearing gloves, a buttonable strap neck and two large outside patch pockets. Early versions were knee-length but later ones were shorter. 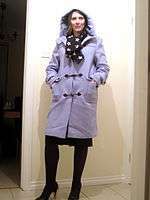 Modern coats are made in a softer woollen material. The coat has had many notable wearers and is associated with left-wing politics. 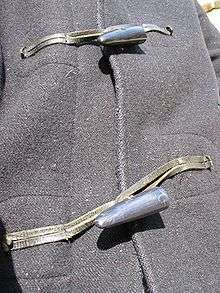 Three or later, four front wooden or horn toggle-fastenings with rope or leather loops to attach them to, thus also known as a "toggle coat," especially in the United States. The wooden toggle-fastenings were made to be easily fastened and unfastened while wearing gloves in cold weather at sea. Current designs often have toggles made of buffalo horn, or plastic. The oversized hood offered enough room to wear over a Naval cap. In Italy the duffle coat is called 'Montgomery'. For many years they were seen in the popular press as a form of uniform for stereotyped supporters of the left wing, as characterised by Labour leader Michael Foot. 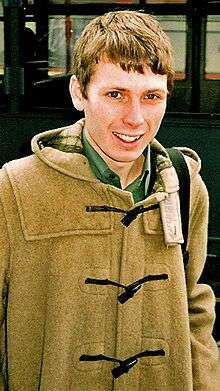 Other famous duffle coat wearers include members of Scottish band Belle and Sebastian, American businessman David Woodard, English actor Dudley Moore, television character Jonathan Creek, children's book and television character Paddington Bear, Ed Helms as Andy Bernard in the American version of the popular British television comedy show The Office, and all members of the English rock music group Oasis on the cover of their 1995 hit single "Roll with it".